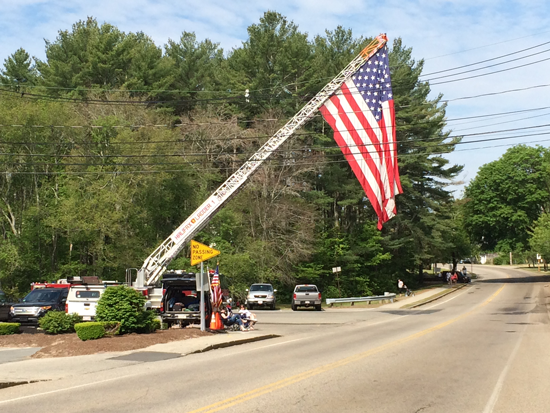 Ladder 1, to be retired this year and replaced, flies the flag over Plymouth Street before the parade marches by. Photo by Abram Neal. Halifax – the Memorial Day parade and ceremonies went off smoothly last Monday in Halifax. As temperatures soared into the 80’s, the morning was filled with ceremony and public displays of celebratory patriotism as hundreds of townspeople lined Plymouth Street and gathered on the Town Green to take in the event. Beginning before 9 a.m., those marching in the parade began to gather at Shelby Plaza to line up. Representatives of the Cub Scouts, Girl Scouts, Boy Scout Troop 39, the Lions Club, the Halifax Police Department, the Halifax Fire Department, the Selectmen, and the Veterans of Foreign Wars Post 6258 all participated. Promptly at 9:30 a.m., with everyone in place, those marching (or in the case of some police and firefighters driving their vehicles with sirens and lights flashing) began a brisk walk to the Town Green. At the Halifax Fire Station, Ladder 1, which is being replaced within the year, a gigantic American flag hung from the outstretched ladder. Cub Scouts and Girl Scouts threw candy out to the onlookers, who quickly grabbed it before traffic resumed on the busy street. Once the parade arrived at Town Hall, Town Moderator John Bruno presided over the gathering as Master of Ceremonies, addressing the crowd from the front steps of Town Hall. In the background, the water tower was draped with a gigantic flag, as the Boy Scout and Fire department color guards held their flags. An invocation was read by Rev. Michael Hobson of Our Lady of the Lake Church followed by the National Anthem sung by student and Girl Scout Sara Slager. Three students, one each from the fourth, fifth, and sixth grades at Halifax Elementary School read their winning essays on what Memorial Day means to them and were awarded a certificate by each of the Selectmen, including newly-elected Thomas Millias. Guest speaker State Senator Thomas Kennedy addressed the crowd regarding what Memorial Day means to him, his respect for the military, and the three members of his family who have served. One family member even evacuated refugees from Vietnam. Firing guns in salute was heard next as the Veterans of Foreign Wars, the Veterans Officer, and Selectman Troy Garron with two Eagle Scouts laid wreaths at two memorials, one across the way adjacent to South Street and one on the Town Green. Finally, the Girl Scouts sang “You’re a Grand Old Flag” as the flag was raised and lowered back to half- staff in respect by the Boy Scouts. Master of Ceremonies Bruno concluded with a few final words, and the ceremonies concluded. Refreshments were provided by the Girl Scouts.